If you are looking for best water purifier with TDS controller then I must say you are at the right place because here I have reviewed best RO water purifiers which have TDS controller. If you are looking for a water purifier with unique looks and a glass holding tray then Aquaguard Geneus is ideal for you. First let’s have a look at the design and build quality of this water purifier. As mentioned above Aquaguard Geneus comes with a very unique and elegant looks. So if you are very concerned about the decor of your kitchen then this water purifier will definitely enhance the look of your kitchen. Additionally this water purifier comes with a glass holding lever. So you don’t have to hold the glass while filling it, which is quite convenient. Other than that, at front this water purifier has and LED notification panel and just below that there is a tap for dispensing water. Now let’s see the purification system of this water purifier. Aquaguard geneus have RO, UV and UF all tfree water purification Technologies. This water purifier has an advanced sensor which senses what kind of water purification will be required for the available water. The RO purification is consist of RO membrane which has minute force of 0.00001 Micron. Water is passed with the great force through this RO membrane. This membrane allows water molecules only to pass through it and blocks dissolved Salts and solids from the water. It also removes heavy metals like mercury, arsenic and lead from the water. Ultimately softening the hard water. Now let’s have a look at the UV purification in this water purifier. This water purifier completes its UV purification in 2 stages. The first stage of purification is of UF filtration. This purification stage is consist of UF membrane of 5 microns. Which separates suspended physical and visible impurities from the water. Volatile organic compounds as well as pesticides are also removed in the stage of purification. Once there are no visible or physical impurities in the water then the water is subjected for UV purification. In the UV purification water is exposed to the UV rays of the UV bulb which inactivates harmful bacteria, viruses and protozoa from the water making it 100% microbe free. Aquaguard Geneus does not uses any kind of chemicals for the purification of water. Thus the water purified by this water purifier is 100% chemical free. The best part about this water purifier is the taste of water it produces. You can adjust the taste of the water as this water purifier comes with a TDS controller as well. The TDS controller also helps retaining the essential minerals like calcium, minerals and iron in the water. Aquaguard geneus comes with a water storage tank of 7 Litres. This water purifier comes with a built in warning system which will notify you whenever you will have to change any of its cartridge or filter, ensuring you get pure and safe water every time. It will also warns you with the LED indicators whenever there will be any duplicate cartridge fitted in the water purifier. This feature is quite helpful. The advance sensor basically notifies you whenever the water purifier will require any maintenance or any of the cartilage for filter needs to be changed. This sensor basically warns you with the LED indicator whenever there will be any duplicate cartridge or filter is fitted in the water purifier. This sensor will automatically fill the water in the water storage tank whenever the water level goes down ensuring that you get your water every time. Aquaguard geneus comes with an advanced biotron cartridge which basically breaks down the water molecules so that it will be a lot easier for your body to absorb the it. This water purifier comes with taste guard technology which basically automatically senses and chooses what kind of water purification would be required for the available water. This water purifier comes with a user friendly LED display which will help you adjust the water purification process. It will also shows the water level in the water storage tank, which is quite helpful. Users really like the taste of the purified water coming out from this water purifier. They also like the advanced features of this water purifier. If you are looking for a water purifier with unique, elegant looks and advanced features then Aquaguard Geneus is an ideal choice for you. This water purifier comes with a good water purification system and some pretty advanced features. Also you may find the maintenance of this water purifier quite expensive. If you are looking for a reliable water purifier with all the essential features then Kent Grand Plus is ideal for you. This water purifier is equipped with RO, UV and UF water purification Technologies along with a TDS controller. This water purifier comes with all the essential features with reasonable price. This water purifier is built from Food grade plastic which is non-toxic and durable as well. This water purifier has a very traditional looks.At the upper side, the filter are visible and are covered with transparent cover. On the lower side there is a water storage tank and traditional tap for dispensing water. This water purifier also has water level indicator. This water purifier is equipped with RO, UV and UF water purification. Additionally this water purifier comes with a TDS controller. The first stage of purification is consist of sediment filter which removes physical impurities likes sand, mud, dust and suspended solids from the water. The second stage of purification is consist of activated carbon filter which removes harmful chlorine and chlorine by-products, volatile organic compounds (VOCs) as well as bad taste and odour causing contaminants from the water. The third stage of purification is of ultrafiltration which is consist of UF membrane. The UF membrane has a very tiny pores of 0.01 Micron which remove bacteria and cysts from the water. The fourth stage of purification is of RO filtration. This the stage is consists of RO membrane which has very minute pores of 0.00001 Micron which allows water molecules only to pass through it and blocks harmful dissolved Salts and solids from the water. It also removes heavy metals like arsenic, lead and Mercury from the water. The fifth stage of purification is of ultraviolet filtration. At this stage water is exposed to the UV rays of the UV bulb which inactivate harmful bacteria and viruses from the water. The sixth stage of purification is consist of post carbon filter which works as an polisher and enhances the taste of the water by adding essential minerals in it. Kent Grand Plus does not uses any kind of chemicals for the purification so the water purified by this water purifier is 100% chemical free. Kent Grand Plus comes with a TDS controller which will help you to control the TDS of water manually. The TDS controller helps in retaining essential minerals in the water. Kent Grand Plus comes with a water storage tank of 8 litres which is made from Food grade plastic which is non-toxic and durable as well. Kent Grand Plus comes with LED Notification indicator which will notify you whenever you will have to change any of its filter or whenever the UV bulb gets ineffective, ensuring you get pure and safe water every time. Kent Grand Plus comes with a spin welded RO membrane which is damage resistant. So it will not get easily damage due to physical impurities in the water. This water purifier is equipped with high power UV bulb of 11 watts which is more effective in inactivating harmful bacteria, viruses and protozoans from the water. This water purifier comes with a built in SMPS. The SMPS basically works as an voltage stabilizer. It stabilizes the high voltage current during voltage fluctuation ensuring that no harm will cause to this water purifier during voltage fluctuations. This feature is very helpful as it ensures the long life of water purifier. All the components of this water purifier are push fit. Which basically means that all the components of this water purifier are attached to each other in such a way that it will not cause any kind of water leakage, which is relief. This water purifier performs all its operations automatically like filling the water storage tank whenever the water level decreases ensuring that you get pure water every time. Users are very happy with the purification of this water purifier Some users also found the maintenance of this water purifier quite expensive. If you are looking for a reliable water purifier with all the essential features which comes in at a very reasonable price tag then Kent Grand Plus is a good choice for you. This water purifier has all the three that is Arrow UV and UV water purification and 6 stage water purification so it has a very solid solution for the purification of water. Overall the build quality of this water purifier is also good. If you are looking for a water purifier with unique and compact design and some unique features as well then Livpure Touch Plus is ideal for you. This water purifier comes with all the three i.e. RO, UV and UF water purification technologies and it also has a TDS controller. Livpure Touch Plus has a very unique and fresh design. This water purifier is pretty compact but it also has a large water storage tank. At the front there is a small digital display and some buttons for dispensing water. This water purifier does not comes with a traditional water dispensing tap, instead it has buttons for dispensing water. This water purifier is equipped with all three i.e. RO, UV and UF water purification technologies. Additionally this water purifier also comes with a TDS controller. Livpure Touch Plus completes its water purification in 7 stages. The first stage of purification is consist of Pre filter which removes visible and physical impurities from the water like sand, mud and dust etc. The second stage of purification is consist of sediment filter. The sediment filter remove suspended particles as well as sediments from the water. The third stage of purification is consist of pre activated carbon filter. This filter remove harmful chlorine and chlorine by products. It also removes pesticides, herbicides and bad taste and odour causing contaminants from the water. The Fourth Stage of purification is consist of antiscalant filter. This stage basically works as an protector for the RO membrane by removing the salt which may deposit on the RO membrane and form layer which reduces the life of the RO membrane and also the purification capacity of it. When all the salts are removed at the fourth stage of purification then the water is passed for the RO filtration at fifth stage. The fifth stage is consist of RO membrane. Water is passed with a great through this RO membrane which allows water molecules only to pass through it and blocks harmful dissolved Salts and solids from the water as well as heavy metals like Arsenic, Lead and Mercury. The 6th stage of purification is of ultraviolet filtration. This stage of purification is consist of UV bulb. At this stage water is exposed to the UV rays of the UV bulb which inactivate harmful bacteria viruses and protozoa was from the water making the water 100% microb free. Which removes remaining impurities like bacteria and cysts from the water ensuring that there are no impurities in the water. Livpure Touch Plus does not uses any kind of chemicals for the purification of water which means the purified water is 100% chemical free. Livpure Touch Plus comes with a TDS controller which allows you to control the TDS of the water manually. The TDS controller also helps retaining the essential minerals in the water. This water purifier has a decent alert system which will notify you whenever you will have to change any of your filter or cartridge. You can also check the filter life of the cartridge in the menu of this water purifier. The menu of this water purifier also shows you the data about the quantity of water remains in the water storage tank which is quite helpful. Livpure Touch Plus comes with a water storage tank of 8.5 litres which is made from Food grade plastic which is non-toxic and durable as well. Livpure Touch Plus does not comes with a traditional tap for dispensing water, instead it has some buttons for dispensing water. When you choose this option the water purifier will dispense the water enough for filling a glass of water and then it will automatically stop the dispensing. When you choose this option the water purifier will dispense the water enough for filling a water bottle and after that it will automatically stop dispensing. As the name suggest, when you choose this option the water purifier will continuously dispense the water until you stop the dispensing manually. Other than about three options this water purifier comes with manual valve for dispensing water. This water purifier comes with a taste enhancer which basically enhances the taste of water by adding essential minerals in it. Users are very happy with the design and build quality of this water purifier. They also found the multi dispensing option of this water purifier quite helpful at the same time same user also found it inconvenient. If you are looking for a compact water purifier with unique looks and features then Livpure Touch Plus is ideal for you. This water purifier also come RO, UV and UF water purification and a TDS controller as well. The 7 stage purification of this water purifier is pretty solid solution for the purification of any kind of water. 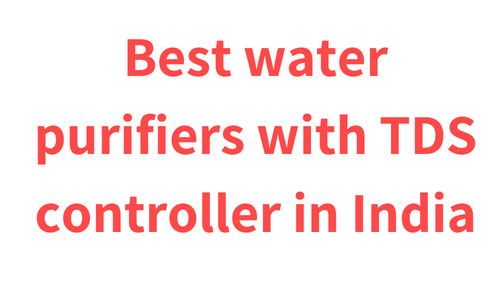 So these were the best water purifiers with TDS controller available in India. I hope yo found this list helpful. Let me know if you have any questions in the comments section below. I’ll be happy to answer them all. Kent Vs livpure Vs Aquaguard. Which one is the Best? Kent vs Pureit vs Aquaguard. Which one is the Best?